Do you think you could have some hearing loss? It’s important not to ignore the signs, which can include having trouble hearing people in conversation. Here are the steps to follow if you suspect hearing loss, according to audiologist Craig Newman, PhD, Vice Chair and Section Head of Allied Hearing, Speech, and Balance Services at Cleveland Clinic. 1. Visit an audiologist. “If you suspect a problem with your hearing, this is the first step. It’s important to visit an audiologist to have it evaluated,” Dr. Newman says. 2. Get medical clearance. You’ll need to visit your doctor and obtain medical clearance before being fit with hearing aids. This means you must either have the written medical clearance from your doctor or you must sign a medical waiver (only when no ear problems can be found). 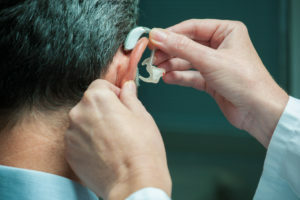 “It is important to determine whether your hearing loss needs to be medically or surgically treated before seeking hearing aids,” Dr. Newman says. 3. Receive a hearing needs assessment. Next, you’ll need what’s called a hearing needs assessment, which should be completed with the audiologist. “During this consultation, the audiologist will discuss the various types of hearing devices available and together you will decide which hearing aids are most appropriate for your lifestyle, communication needs, and budget,” Dr. Newman says. A comprehensive treatment plan from your audiologist will also help you learn how to care for your hearing aids and how to use them with other communication strategies to get the highest satisfaction, he says. There are four basic styles of hearing aids. Each contains a microchip to help you distinguish speech from background noise. Aesthetically, they come in a variety of sizes, shapes and colors. In the ear (ITE). There are a range of ITE size hearing aids that are worn within your ear and are custom-fit. Audiologists may recommend this style for older patients who have manual dexterity problems such as arthritis. Smaller completely-in-the-canal devices may be appropriate for those with cosmetic concerns. Behind the ear (BTE). These fit behind your outer ear and are appropriate for a wide range of hearing losses, from mild to severe. Tubing routes the sound into your ear canal via a custom-fit ear mold. Open-fit miniature. With an open-fit concept, a miniature BTE hearing aid is coupled to an ultra-thin tube with a soft tip that fits in the ear. So, they amplify sound, but natural sound also can enter your ear. Receiver in the canal (RIC). This style also uses a miniature BTE with the open-fit concept but uses a speaker built into the ear tip instead of the main body of the hearing aid. The open-fit design with the soft tip or RIC is perhaps the most cosmetically appealing, Dr. Newman says. All you see is a small plastic tube or coated wire that leads to the ear canal. Better microchip technology has improved the signal-processing capabilities of hearing aids in recent years. Many hearing aids now also connect directly with mobile phones for easier telephone conversations. They keep getting better all the time. Once you address hearing issues with the right hearing aids, you can feel more connected to life and to others.